Emilio Leofreddi was born in 1958, he lives and works in Rome as a painter and videomaker. At the beginning of the 90's he started making video installations and performances based on political and social issues. In 1992 he made his first installation "Whales", against whaling, sponsored by Greenpeace and financed by the artist Mario Schifano and in 1993 his work "Contact", against the death penalty, sponsored by Amnesty International and Nessuno tocchi Caino. 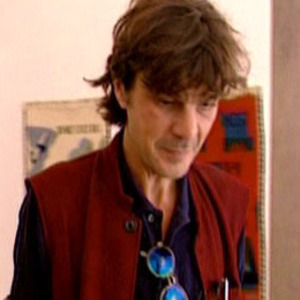 In 1999 he founded in Rome, along with Ivan Barlafante, Claudio di Carlo and Andrea Orsini, the collettive art studio Ice Badile Studio; still in 1999 he had his solo exhibition "Human being" at MOCA - Museum of Contemporary Art of Washington D.C. (USA). In 2004 he started working on the trip as an artwork and on a travel diary to be completed on Tibetan rugs and Indian tents, so the project "Dreams" takes shape and leads him, after very long time, back to live in India for one year, for the realisation of the works. The artworks are then exhibited in Italy, at Art Basel Miami (USA) and in 2007 at the Xth Biennale of Cairo (Egypt), where he received the Critics' Award. In 2009 he exhibited at the Vittoriano in Rome the installation "The breath of the world", made "‹"‹with Indian tents sewn in Goa (India). Numerous solo and group exhibitions that brought him to exhibit his work in Italy and abroad, including England, USA, Germany, India and China. Some of his video works have participated in film festivals and exhibitions of video art. The work of Leofreddi was presented at the Academy of Fine Arts in Milan, Florence and Rome. His works are part of public and private collections both nationally and internationally. The videos "Contact" (1992), against the death penalty, and "Im - Media" (1994), about advertising, were acquired from the Archive of Video of Palazzo delle Esposizioni in Rome.